Valuable insights, ideas and contributions presented during the 10th “International Conference on Metadata and Semantics Research” (MTSR 2016) made it a memorable and intellectually vibrant event. In this new edition of MTSR, a number of innovative semantic resources in the interdisciplinary fields of metadata, data and semantics was presented. Moreover, novel approaches in the implementation of semantic technologies across diverse types of information environments and applications were disseminated to cross-institutional and cross-disciplinary communities of practice. 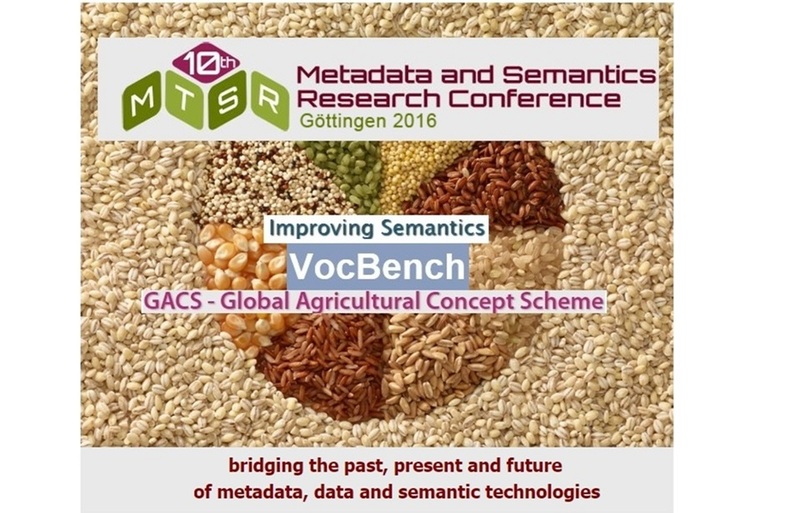 MTSR 2016 also co-located four workshops, two of them dedicated to successful semantic products, namely the latest version of VocBench and the Global Agricultural Concept Scheme (GACS). VocBench is a free, web-based, multilingual, editing and workflow tool that manages Knowledge Organisation Systems (KOS, such as thesauri, authority lists and glossaries) published in SKOS / SKOS-XL. Being designed to meet the needs of Semantic Web and linked data environments, VocBench provides tools and functionalities for collaborative editing and multilingual terminology management. VocBench also includes administration and group management features that permit flexible roles for maintenance, validation and publication of the edited datasets. VocBench 3.0 is currently funded by the ISA2 Action on 'Promoting semantic interoperability amongst the European Union Member States (SEMIC)' EU Programme. With an entirely new user interface and a largely revised backend architecture, VocBench 3.0 builds on the knowledge acquired from its previous versions. While VocBench was initiated at FAO as the “AGROVOC Concept Server” to maintain the AGROVOC multilingual agricultural thesaurus (32,000 concepts), VocBench 2 was developed by the University of Rome Tor Vergata to collaborative edit SKOS-XL thesauri. In its third incarnation, VocBench will further advance as a collaborative platform for management of SKOS thesauri and OWL ontologies, with particular emphasis on controlled collaboration, extensibility, scalability, multilingualism and more agile user interaction. VocBench is currently used for the maintenance of many thesauri world-wide, such as AGROVOC, EUROVOC, GEMET, TESEO, the Unified Astronomy Thesaurus, to name a few. Just as VocBench has contributed to the management of AGROVOC, the Global Agricultural Concept Scheme (GACS) includes AGROVOC in its pool of interoperable concepts. In particular, this pool is based on a mapping of AGROVOC concepts, the CAB Thesaurus (140,000 concepts) and the NAL Thesaurus (53,000 concepts). All these three multilingual thesaurus of terms and concepts are related to agriculture and they are maintained, respectively, by FAO of the United Nations, Centre for Agriculture and Biosciences International (CABI) and US National Agricultural Library (NAL). GACS acts as a bridge connecting the aforementioned thesauri. The latest GACS beta version provides mappings for the 10,000 most used concepts from the cited thesauri for indexing the related sets of documents (from AGRIS, CAB Abstracts and Agricola) and merging the information available from the three thesauri. Mappings were automatically extracted and then manually evaluated. GACS beta is now in VocBench for manual edit and maintenance, and displayed for browsing using the SKOSMOS platform (watch: Publishing SKOS concept schemes with SKOSMOS). GACS data can be also freely downloaded. The workshop dedicated to GACS focused on discussing the current GACS beta and its suitability to support a variety of use cases in addition to document indexing. Participants in the workshop (on site: from INRA, Bioversity, NAL, CABI, LIRMM, Land Portal Foundation and from distance: from IFPRI, InterAction,CREA) discussed the possible inclusion in GACS of focused sets of concepts providing stable identities (such as datasets of observations in agriculture) for reuse in applications. There was a convergence of interest in this, as the possibility of reusing well-defined, open, stable and accessible identities in local information systems represents an advancement towards the possibility of connecting data from different sources and so achieving data interoperability. In its future development, GACS will also include other resources (such as thesauri, code lists, and ontologies) useful for the semantic description of data. In the coming weeks a full report of the discussion raised during the workshop on GACS will be published, together with a document describing the vision shared by partners on semantics for data interoperability in agriculture. Among other priorities, the current development phases of VocBench and GACS are focused on extending partnerships to additional organizations and partner thesauri.